The picture you see above is Gus Brickner aka the Human Polar Bear. 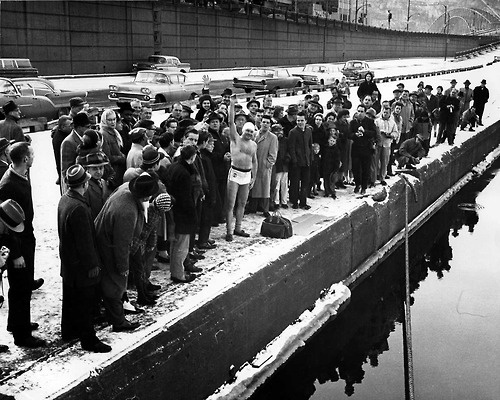 My dad was fascinated with the exploits of this long distance swimmer who distinguished himself by his winter swims in the Monongahela River in the winters around Pittsburgh. His famous New Years Day plunge in 1962 was witnessed here by yours truly and my dad. He said,” Patrick, lets go down and see Gus Brickner jump in the Mon.” As an 8 year old kid, I was thrilled that my dad wanted to take me and off we went to see the guy who eventually logged 38,500 miles swimming, two English Channel attempts, and swimming behind the ice breaker boats in the Mon during the most brutal winters near Charleroi, Pa.
My dad was an engineer and he always wanted to show me things that meant something to him as a technical person. 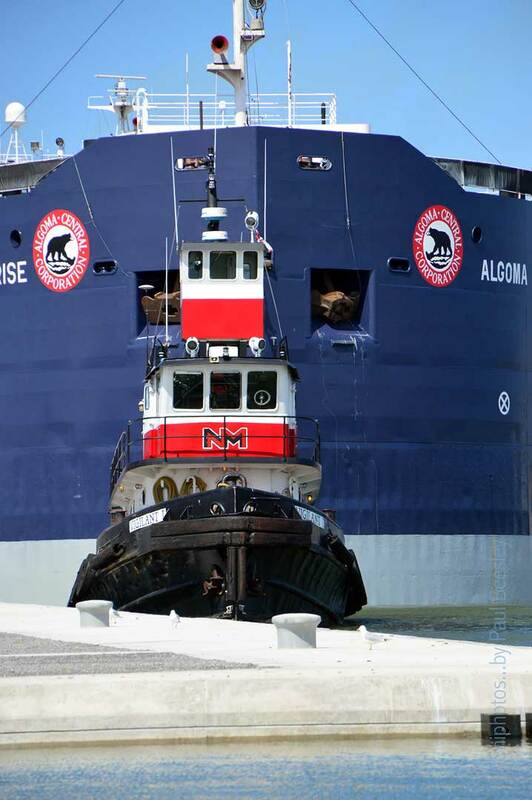 I remember going to Geneva on the Lake when I was a kid and my dad taking me to Sandusky, Ohio to see the big ore freighters that traveled the Great Lakes bringing iron ore to the steel mills. He would explain the process of making steel and eventually built a continuous caster scale model for me to enter into the Buhl Planetarium Science Fair. Now, I knew nothing about continuous casting in the steel industry as a young kid and when asked about the project, I fumbled my way with the nuns trying to explain what my dad had told me. To my surprise, I was not a technical person, but my explanation along with my contrite personality with the nuns, got me a good grade and also an entry into the Science Fair. I( we- my dad) eventually ended up in the finals and once again, I had beads of sweat coming out of the arm pits trying to explain the virtues of the continuous caster. My dad was so proud of his- er a – my project. Not long after the visit to the Mon to see Gus the Polar Bear, it seemed like spring came early and off we were to the ball games at Forbes Field. 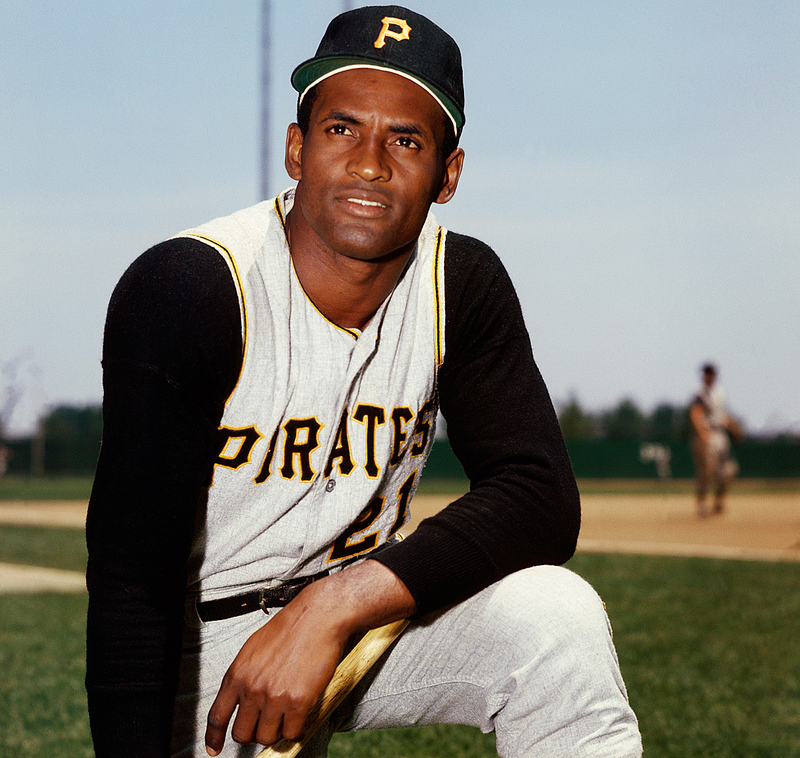 My dad, being a fan of baseball, explained the technical aspects of fielding a baseball to me and under no circumstances was I ever to do a “basket catch” like my idol Roberto Clemente. My dad dissed him as a “hot dog” but I was impressed that he could throw out guys at the plate all the way from right field. To me – the “Great One” was something but to my dad, if you did not have the glove over your head and trap the ball with the other hand so as not to drop it, you were not technically a good ball player. 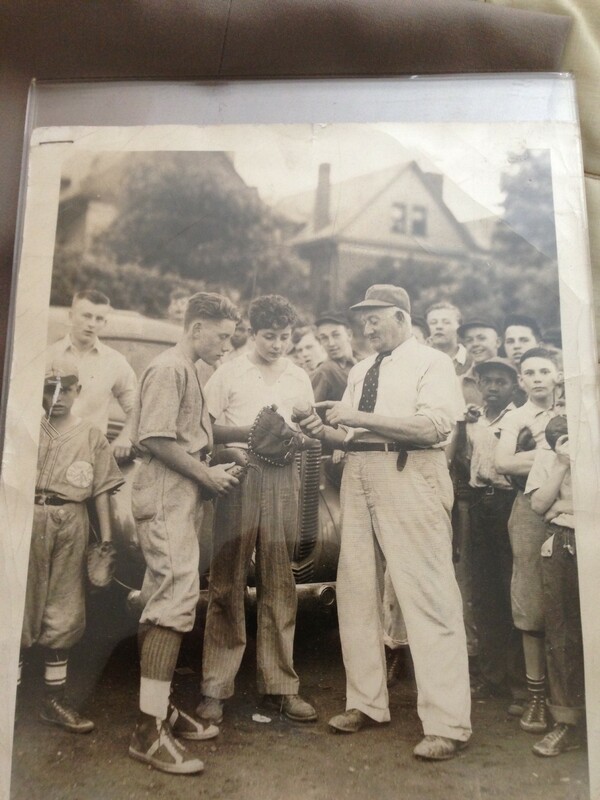 My dad- seen here in the middle with the great Honus Wagner back in the day in Bellevue. It really did not matter to me that we went down in the middle of winter to see a guy jump in the icy river, or make the trek to see the giant ore boats, or go to the ball park, or launch Estes rockets across the street that my dad had built for me. It was the chance to spend time with my hero, my dad. 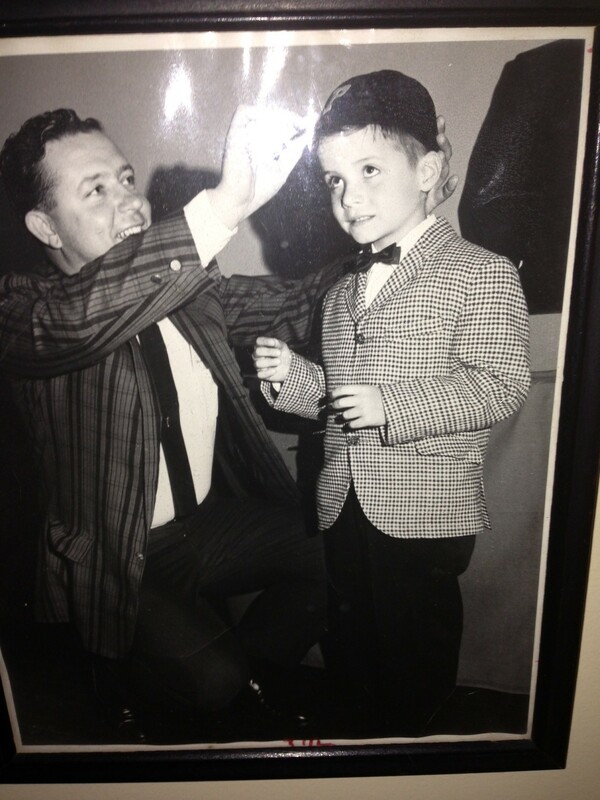 He took the time for me and showed me things as a young kid that I remember to this day- a man in my 60s. I remember the kite flying when my dad would use three balls of string and stretch the kite out into the stratosphere- or so it seemed to me. The cleaning bag flying balloons powered by a little can of sterno glued to a cross bar of balsa wood – floating away into the clear night air. So many fun projects and excursions. The first time my sister and I went skiing, we were stuck in a raging snowstorm on the Pa turnpike – on my dad’s birthday, because he wanted to get us started on what he termed the sport of a lifetime. He and my mom did not ski but they made sure we did. The father and son swim competitions where I would see that big smiling face swim to the wall watching me take off in relay fashion. Gus Brickner, the great Roberto were all heroes to me. But the main hero was the guy who took the time to take me to see them. For you young fathers out there, take a page out of R.J McCloskey’s book. Spend time with your son and daughter. You will never get that time back and they will remember it forever. I did. I saw Gus jump in the river when it was snowing in 1962. Thanks for reading. This entry was posted in Aging, American Culture, Baseball, Fatherhood, Inspiration, Long Distance Swimming, outdoor activities, outdoor sports, Outdoors, Pittsburgh.